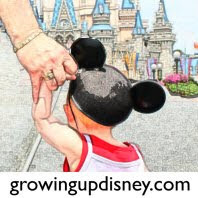 Growing Up Disney: Check Out Our New Mobile App! To make it even easier to connect with us on the go, DisneyDad has created a Growing Up Disney app. We'd love it if you'd take a look and let us know what you think. You can download it from the link above and it will be available on app stores soon. We are excited to be the Mobile App of the Week at Infinite Monkeys!